Recently, we upgraded a customer from a local Exchange server to Office 365. For a majority of the users, we purchased Office 365 Business Premium licenses that included Office 2016 (Buy Office 2016). I wasn’t sure what to do so I tried all the things below – but to no avail. I uninstalled Office – twice. Didn’t fix it. Tried Repairing Office 2016 – didn’t work. Logged in with the domain administrator account and tried activating Office – failed. Tried activating office with another Office 365 account – that didn’t work either. Started Office in Safe Mode – no go. I downloaded and installed Office 2016 from his Office 365 account on another computer. This different computer activated just fine! So I knew it was a computer issue, not an Office 365 account problem . Logged into Windows 10 in Safe Mode to activate Office 2016. Failed. I also checked Event Viewer for clues, and I found this. 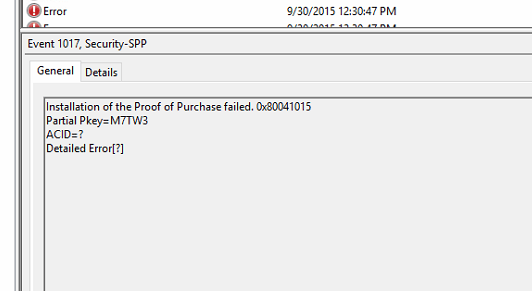 ” Installation of the Proof of Purchase failed. 0x80041015 Partial Pkey=M7TW3″ I looked online for help with this error but I came up empty. I was at the end of my troubleshooting rope. I decided to reach out to Microsoft about this issue. Here is what they advised me to do – and it fixed it! Below you will find the solution. Step One: Sign out from all your Office 365 applications. Go to Control Panel — > Credential Manager — > Windows Credentials — > Delete the Microsoft 15 credentials. Here is the Registry key location from where we can delete the identities and profiles HKEY_Current_User \ Software \ Microsoft \ Office \ 15.0 \ Common \ Identity — > Delete the Identities and Profiles folders. I opened up the Office applications and signed into the user’s Office account. Bingo! It activated right away. Summary: Deleting those offending registry keys was the step that fixed my issue. I hope this can help someone else. Please leave a comment below if this helped or if you have anything to add. This entry was posted in Troubleshooting and tagged Office 2013, Office 2016, Office 365, Windows 10 on October 2, 2015 by Merlin Halteman. What version of Office did you have previously? Thanks Lynn worked for me ! Thanks for posting your tip! I appreciate your input on my blog.